Sorry for those of you looking for a famous children’s band. When I say Wiggles, I am talking about a photographic technique in which two similar photos taken a few inches apart are animated. The result is a somewhat three dimensional looking image. If you have two similar cameras you can make a rig to space them similarly to how the human eyes are spaced to provide a simultaneous three dimensional image. This technique is similar to the old stereoscopic photographic viewers that have been around for 100 years. However, the novel twist here is that they are provided in rapid time sequence. For instance, here is a small (110 kB) and a large (360 kB) wiggle photograph of the World’s Tallest Water Sphere taken on 2007-12-29. 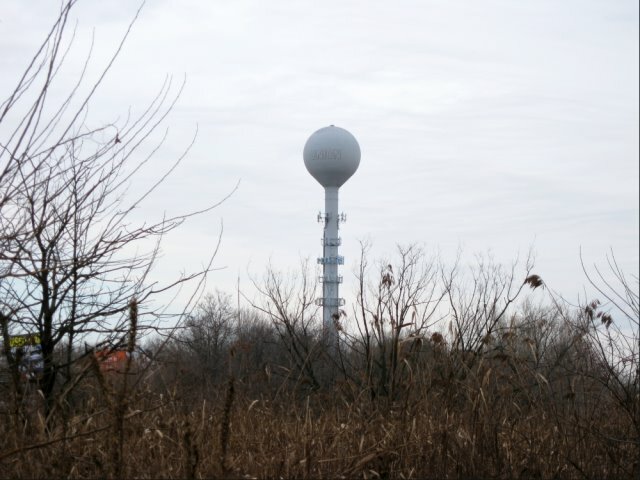 You get the idea that the reeds are nearby and the water tower is far away. Have fun with your viewing, and a happy wiggly new year to you all. This entry was posted on Monday, December 31st, 2007 at 2:54 pm	and is filed under Art, Photos. You can follow any responses to this entry through the RSS 2.0 feed. Both comments and pings are currently closed.